It’s impossible to report on crime or the justice system without reporting on race. Attention has recently focused on the disproportional number of unarmed black men killed by police officers. But there is much more to understand about the subject of race and criminal justice — and it is much more than a black and white issue. Those of different races and ethnicities have different interactions with the criminal justice system, and it is inaccurate and unfair to ignore those differences.  Journalists need to address the systems that create and uphold racial inequality in the criminal justice system. Every story — even a daily crime report — is an opportunity to share information about how the system works and how that affects different groups of people. 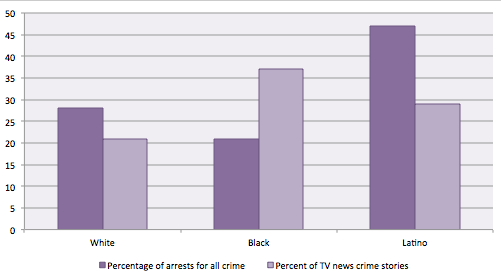 Historically, media coverage of race and crime has been unfair to non-white citizens. Black men are often overrepresented as suspects and perpetrators of a crime. White men are more likely to be ignored, seen as victims or heroes or, if they commit crimes, compromised by mental illness. Latino people are often suspected of being undocumented. A 2000 study of local television news reporting in Los Angeles and Orange County found that black and Latino people are frequently depicted as criminals instead of victims, while whites are more likely to be portrayed as victims rather than criminals. This plays out in the disproportionate coverage of incidents involving those groups. It is important to note that this study draws from one geographic location and may not represent a trend across the country. Nazgol Ghandnoosh, a researcher with The Sentencing Project, said during an interview with WNYC that these misrepresentations can have real-world effects. Her research found that white people are less likely to be empathetic toward criminals and support more punitive sentences compared to black people, though blacks are more likely than whites to be victims of crime. This happens, Ghandnoosh said, because white people perceive crime as something committed primarily by people of color and have less empathy to those unlike them. This creates a lack of motivation to address the real problems underlying crime and to find effective solutions, Ghandnoosh concluded. It is important for journalists to consider the consequences of this finding. People of color may be more hesitant to speak to the press because the press has historically misrepresented them. 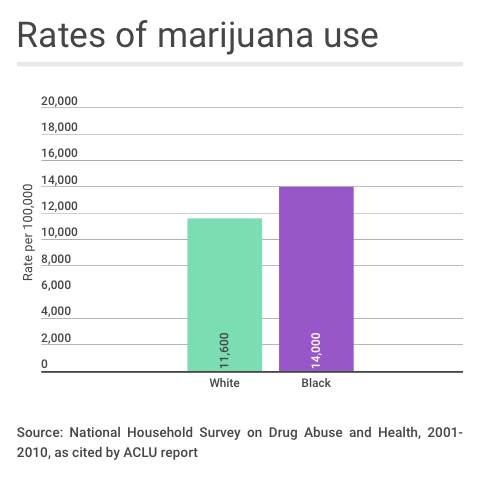 Despite similar rates of drug use, black people are far more likely to be arrested for drug possession than white people, according to reports from the American Civil Liberties Union and Human Rights Watch, based on crime statistics from the FBI. The Washington Post has broken the report into nine handy charts. These two clearly show a discrepancy. It is important to note that FBI data does not differentiate Latino people from white people. If the Latino population were separated, the statistics could look different. The 464-page report looks at policies that contribute to high levels of incarceration and the underlying causes of crime. Both provide a valuable, research-based backbone for reporting on the systems that affect the criminal justice landscape. 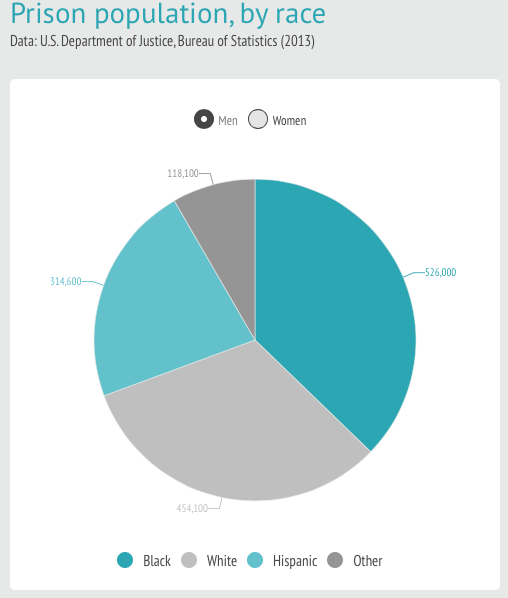 A summary of the report’s findings are available at Journalist’s Resource. Many advocates for social change compare mass incarceration to the Jim Crow laws that restricted black American rights from the late 19th century to the 1960s. In this Ted Talk, Ohio State associate professor of law Michelle Alexander presents the argument she makes in her book, “The New Jim Crow”: Mass incarceration is a more-subtle cousin of Jim Crow. 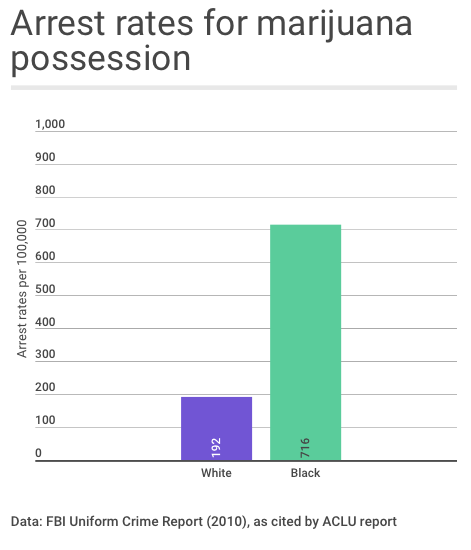 You can find more data about race and incarceration in this graphic. American culture persistently ties gang activity to black and Latino communities. A simple Google search of “gang” pulls up dozens of images that almost exclusively show young black and Latino men flashing weapons and hand signals. The first gangs in America were comprised of white immigrants, so this is a rather recent assumption. Much news coverage has been devoted to gangs in inner-city communities of black and Latino communities, but relatively little attention has been paid to rural gangs, gangs with other races and ethnicities or mixed gangs. While gangs are often portrayed by news and entertainment outlets as racially or ethnically homogenous, this is becoming less valid. Applying blanket racial descriptors to gangs is problematic on another level. Describing one group as an “Asian gang” ignores the inner-group dynamics that may exist among members from China, Vietnam, Japan or other Asian countries. It is also important for journalists to remember that the majority of inner-city, non-whites are not involved with gangs. Most important, it is critical that journalists address the factors that lead to gang activity — concentrated poverty, social/geographic isolation, lack of community resources, few opportunities for meaningful employment, failing public education, poor housing, high crime rates, and the regular removal of a segment of a population (high rates of incarceration among young men, for example). It’s important to note that non-white people are much more likely to live in such communities because of the economic, political and social systems that exclude and devalue them. How does law enforcement determine that a crime is gang-related? What are the indicators? How is law enforcement attempting to reduce gang-related violence? How effective have those policies been? What research concludes that these methods are effective? How are government, law enforcement and community leaders attempting to address the causes of gang-related violence? How effective have those efforts been? As Eric Daggans writes for NPR, news outlets face a Catch-22 when covering race and justice. It can be difficult to accurately and thoroughly cover race in a breaking-news situation. Events are moving quickly and journalists may not have the background or resources to give a story the nuance and depth it needs. Develop a standard newsroom policy for posting mugshots or other photos of those accused of crimes. Studies show that news outlets are more likely to publish mug shots of black and Latino men than white men. This decision perpetuates the stereotype that black and Latino men are criminals. If your newsroom publishes mug shots of criminals or suspects, be consistent, not arbitrary. If the newsroom publishes photos of victims, be consistent and don’t use images from previous incidents. Report the race of a suspect or an arrested person only if it is clearly pertinent to the crime, such as a racially based hate crime. Report descriptions of suspects, including race, only if that description is sufficiently specific to accurately identify a suspect . Physical appearances vary widely within ethnic and racial identities and such identifiers MUST include detailed information. Example: “An Asian male in his late 20s wearing a white shirt” is too broad. “A bald Latino man wearing a black Nike sweatshirt in his early 40s with a short, gray beard and tattoos on his hands” is more acceptable. Report the immigration or residency status of a suspect or arrested individual only if it is relevant to the criminal process that person will face. What is the arrest rate for people of different races in my community? What is the sentencing rate for people of different races in my community? How do sentences for the same crime vary across race in my community? Who is most likely to rely on the public defender system? Does the public defender’s office have the resources it needs to work efficiently and effectively? How does the funding for public defender’s office compare with that of the prosecutor’s office? Who are the judges, prosecutors and public defenders in your community? What are their racial identities? Do people of different races and ethnicities trust law enforcement or the courts? Who else do people turn to for help when they don’t trust these systems? 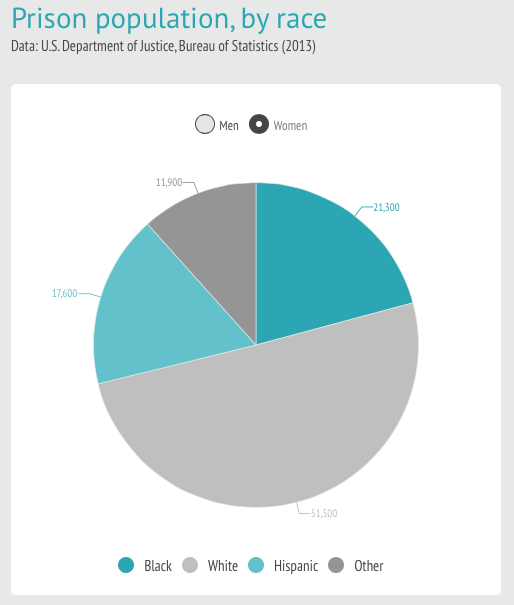 What is the racial and ethnic makeup of a jury? A parole board? When considering crime rate data, what types of crimes are included? Is it only street crime, or does it include white collar crime as well? The types of crimes included will affect reports of the racial demographics among those who commit crimes. “Victims of Gang Violence: The smoke clears, but pain endures” (Los Angeles Times): While this story does not address the systemic issues that create gangs and help them recruit members, it does focus on the innocent victims of gang violence — and victims of systems that created the gangs in the first point. The photo and video story tells stories of struggle and resilience in the recovery from gun wounds. “Black and Blue: Personal stories from the intersection of police and public” (Atlanta Journal-Constitution): This story is a collection of the experiences of black men with Atlanta police. While it is well known that black men are overpoliced and more subject to police harassment than other races, it is often hard to report on the phenomenon because accounts can be hard to verify. But instead of relying on one narrative, this story creates a view of a collective experience through varied and nuanced personal accounts. “Guilty and charged” (NPR): This multi-part series looks at how court and jail fees affect offenders who are poor and creates a cycle of poverty and crime. While it does not address race directly, it is a good example of reporting that focuses on systems. Similarly, this story published by The Washington Post in its opinion section analyzes how “poverty violations,” like failing to carry car insurance or getting your car inspected, creates a cycle of poverty and further violations when the system is not set up correctly. “Does the police force reflect the population?” (St. Louis Post-Dispatch): This simple graphics story compares the percentage of black officers with the black percentage of the population in multiple St. Louis municipalities. It’s simple, but tells a powerful story. “Should prison sentences be based on crimes that haven’t been committed yet?” (FiveThirtyEight and The Marshall Project): This story examines a proposed Pennsylvania law that would factor in a convicted offender’s chances that he or she might commit a crime again into their sentencing length. The story includes analysis of how the risk assessment used could disproportionally affect men of color. 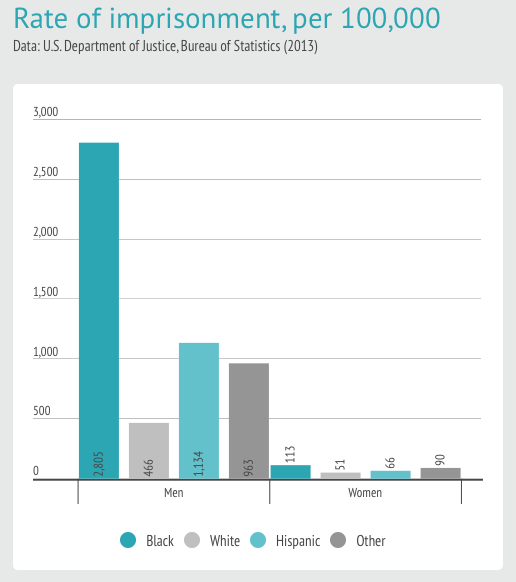 The Bureau of Justice has statistics and studies on race. The Sentencing Project: an advocacy group working to change sentencing laws. The American Civil Liberties Union has a section on its website dedicated to race and criminal justice that includes resources on racial profiling. Poynter’s News University offers an online class on covering community policing and urban violence. Members of Investigative Reporters and Editors have access to tip sheets about using data to investigate crime and immigration.